Closed! Thanks to everyone that entered! Happy 2019 everyone! 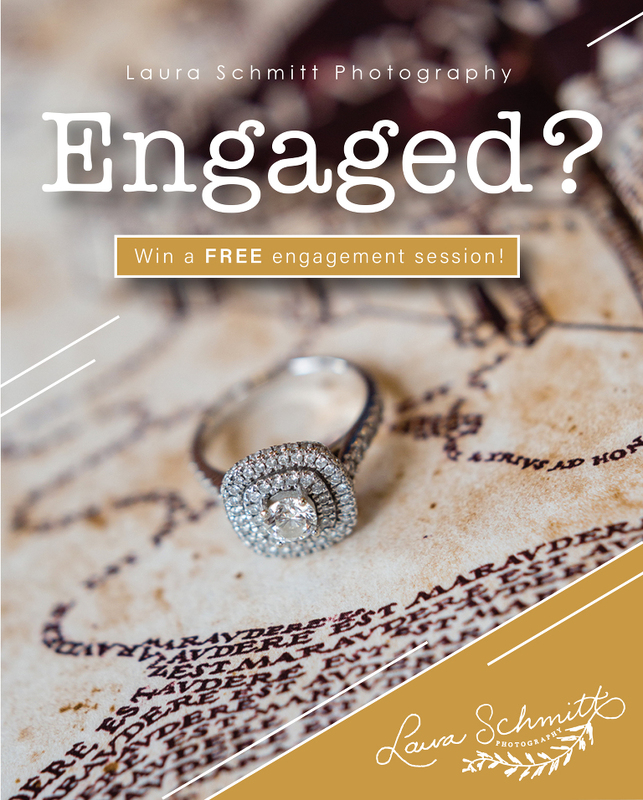 I am excited to announce that I am giving away a FREE Engagement Session! This is the sixth year that I am doing this and it always so fun to do. I love hearing stories of how everyone got engaged. Dan proposed to me right before Christmas, so it brings back lots of happy memories. The winner will receive a 1 – 2 hour engagement session valued at $300. The engagement session includes a USB with the edited images + the print rights + an online gallery of all your images. Are you wondering how to enter?!?! Super! It’s easy! 1. Comment on this blog post to enter! Did you just get engaged? Or is your wedding right around the corner? Just leave a comment and be sure to leave a valid email so that I can contact you if you win! 2. Like Laura Schmitt Photography on Facebook, if you haven’t already. 3. Share away! On Facebook on Twitter…. over a cup of coffee…. however! If you aren’t engaged, but know someone who is…. spread the word! The winner will be chosen through a random drawing of the commentators on this blog post on February 4, 2019. If you have any questions, please email me at laura@lauraschmittphotography.com. Couple must be planning an upcoming wedding in 2019 or 2020. Session date and time will be subject to availability and normally should be booked 30 days prior to preferred dates. Engagement session must take place in Wisconsin. Session cannot be exchanged for cash and substitutions are not accepted. Package upgrades can be purchased at current prices.